To all our Beantown friends and fans. 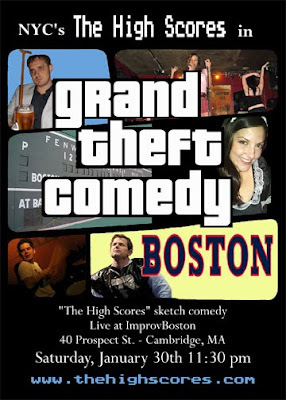 See The High Scores perform at ImprovBoston as part of their "nightcap" show on Saturday, January 30th at 11:30. The High Scores are relaxing and enjoying the holiday season. No shows until 2010, but we are busy shooting some new videos, so look for those soon. In the meantime, make sure you join us on facebook. It'll make us happy.